Create you own ST1E Card-Review! The card review is the classical article to discuss the advantages and disadvantages of a single card. Possible questions are how you could combine the review card with other cards or how this card fits the strategy of your next deck (use riter "New"). When you finish your article the card text and the picture of the review card are automatically added to your review - a special service from openCards for you! The openCards Card-Review database contains all ever on openCards published Card-Reviews and is searchable by several criterias like card name, card type, expansion the card belongs to and the autor of the review (use riter "Search"). For ST1E you will find here over 1.000 Card-Reviews! Or simply take a look the latest published card reviews on openCards to get a idea what you can find here (use riter "Latest"). You will find the latest 3 Card-Reviews here (order desc by publishing date). This Card-Review article was written by Daniel Matteson and was published first on "The Continuing Committee (trekcc.org)" at Nov 8th, 2018. Michael Jonas. This was a guy who appeared in six episodes, as a Maquis-turned-Starfleet officer that betrayed both his crews by giving information to the Kazon and sabotaging Voyager in the process, before getting killed by... um... Neelix. OK, forget that part. This was a fairly major early arc and the fact that Jonas never had a card made seems a glaring omission. Rain Robinson. I enjoyed the "Future's End" two parter and hoped to one day see a personnel card of this early Sarah Silverman role, or even a boutique set to cover the episode as a whole. How about one more past Earth time location? Seska - that is, a second version of Seska. 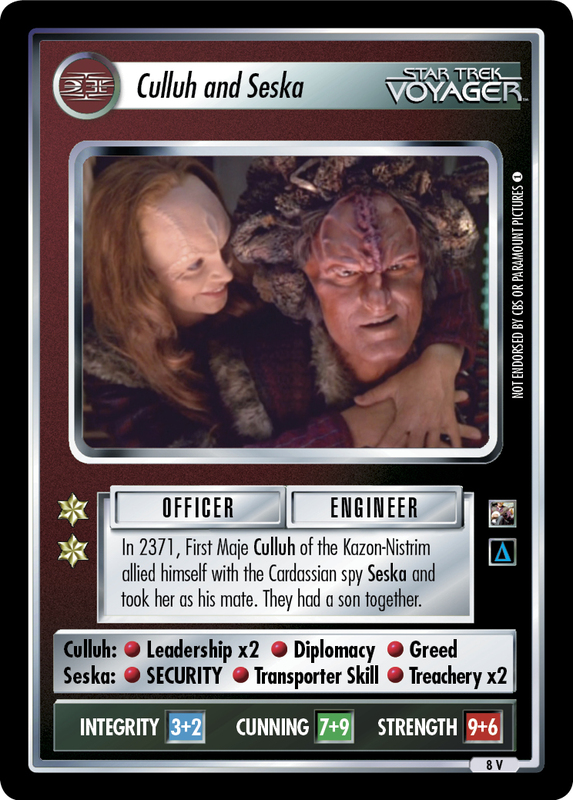 This nefarious character really ran the gamut of shifting loyalties, from Cardassian to Maquis to Federation to Kazon. The original Seska is a dual-affiliation Cardassian/Kazon personnel, but a new persona could have so many different looks. Could there be a Federation/Non-Aligned? A Maquis icon? An infiltrator? Well, we did get one of these cards in The Gift, though not exactly how I would have envisioned it. This Card-Review article was written by openCards user MidnightLich and was published first on "The Continuing Committee (trekcc.org)" at Nov 7th, 2018. ﻿Something I've often heard over the years is that the Hirogen don't need a ton of new toys, but they really need a second way to play people. A common request is also to provide a way for Hirogen to play without relying on the usual crew of Non-Aligned personnel. 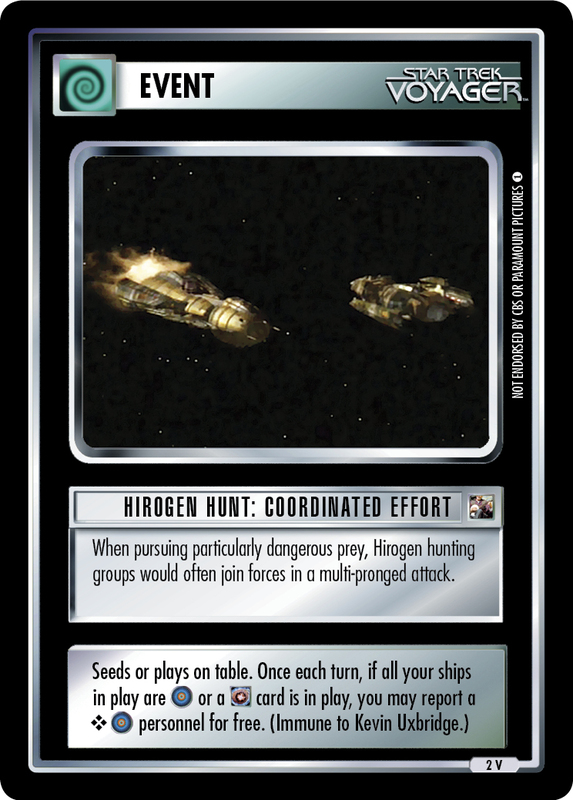 Today's card from The Gift, Hirogen Hunt: Coordinated Effort, is an intersection of those two requests, although it delivers much more on the free report than the all-Hirogen aspect. Hirogen Hunt: Coordinated Effort, is a nice and simple event. Once it's in play (you can seed it or play it), it allows you to play a personnel for free as long as you meet one of two conditions; either all of your ships need to be , or there needs to be a card on the spaceline. All of this appears on just over two lines, leaving room for the event to be immune to Kevin Uxbridge - so your play engine is safe. Why these particular restrictions? They capture the story of the Hirogen hunters pretty well! They work best when they work together (all ships), or when there is big prey ( cards) to hunt. This Card-Review article was written by Paddy Tye and was published first on "The Continuing Committee (trekcc.org)" at Nov 6th, 2018. I rarely posted on the message boards in those days. They were an alien environment to me, however they were useful for answering rules queries. So eventually such an occasion did arise and I needed a handle… but what to use? A lot of people seemed to have chosen existing cards (Mot the Barber, Major Rakal, etc), and given my name is Paddy, I was sure I could find an appropriate equipment card to use. However, I couldn’t be sure if all those existing Equipment cards had or hadn’t been taken by others. I decided the safest route was to pick a “yet to be made” equipment PADD. I mean – what could possibly go wrong? Decipher had already released Previews of Voyager logo cards, and all the major affiliations (except Borg) had all gotten certain cards – a gun, a PADD, an outpost, etc. 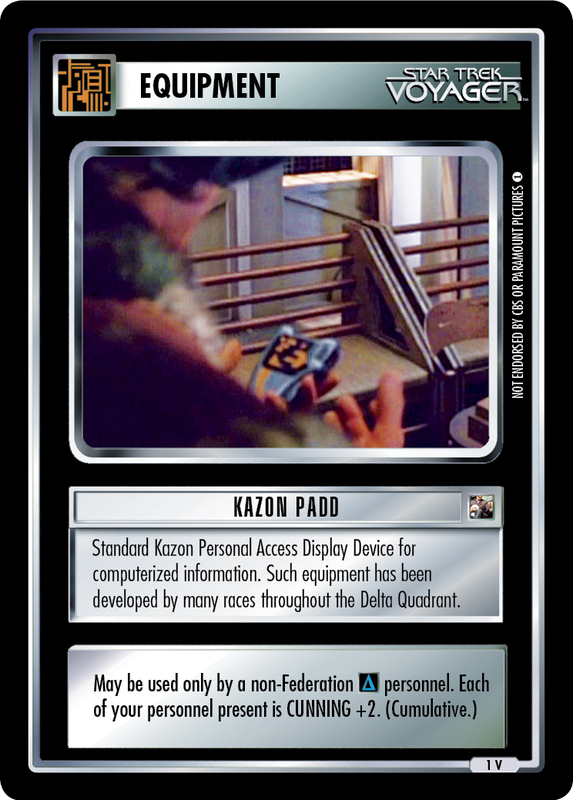 If another affiliation was coming in a future Voyager expansion, it had to be Kazon surely… so that was that – I became "KazonPADD". Then Voyager releases. No PADD.